I love Japanese food. The mere presentation is feast for the eyes. I love mixing my soy sauce with a generous amount of wasabi, and I hold the calamansi. I also have a small dish of pure soy sauce for maki with pink salmon in it; I don't want to kill the taste of the delectable fish with the overpowering sour taste of the calamansi and the spicy wasabi. Plus, the novelty of using chopsticks never wear off. We were invited in Glen and Cory's home for Christmas eve, and I was delighted when I learned that we will be preparing maki! Something I have never done before. I learned that making it is quite fun and easy. Plus, their kids love it! My wife and I are planning to make some this New Year's eve, and add in a bit of variety to the maki. But for the meantime, here is the variation we made at Glen's house. Makisu (bamboo rolling mat) - you can still roll the maki without this, though, but you need more control in rolling so the pressure across the roll is consistent. Mix the tuna flakes with the mayonnaise. Set aside. Make sure you have thoroughly cleaned your hands before proceeding, as this involves directly handling the food. Lay a flat sheet of nori onto a clean surface, with shiny side underneath. 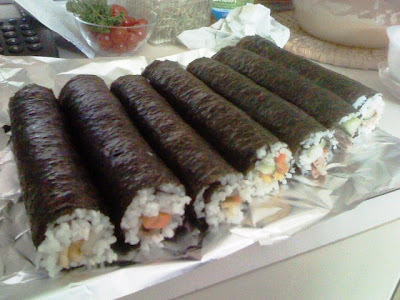 Spread a thin layer of rice onto the nori. Do not squish the rice, just let it spread nicely. Chances are you will notice your first attempt would be too thick but that's ok, you can make the necessary adjustments for the next set. 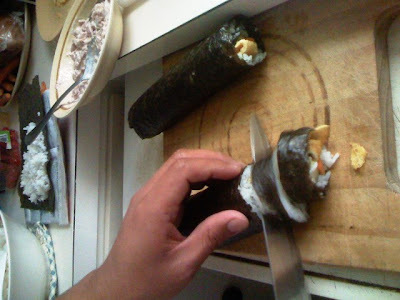 Make sure you leave some space at the far end of the nori; this will seal the maki at the end of the roll. Next, place the fillings near the edge nearest you. 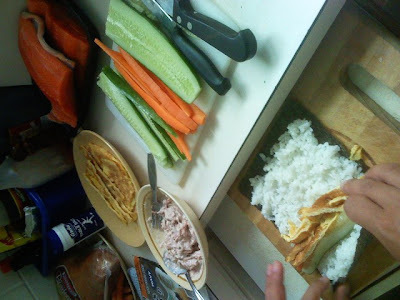 Put in a couple strips of carrots, cucumber, then place either some egg strips or tuna mix. This becomes the "center" onto which the maki will be rolled. Lifting the nori edge nearest you, carefully wrap it onto the filling, applying pressure now and then to squeeze the roll into a tight circle. Continue rolling slowly until you reach the edge. At this point, the far end of the nori will meet will seal the maki. If you feel that the nori would not seal itself, you can swipe a dab of water across before closing it up. Armed with a sharp knife, cut out the rough ends, slice the tube into the middle, put the two halves side by side, then proceed to cut these into bite-size pieces. Wet the knife blade so it will slice through the rice. When the rice starts sticking to the knife, wet the knife again. We found that swift, short strokes of the knife as it slices through works nicely. The ends are "spoils of the war" and consumed promptly. As for the sauce, simpy pour soy sauce into a shallow dish. Place sliced lemon or calamansi and a lump of wasabi beside the soy sauce and serve. 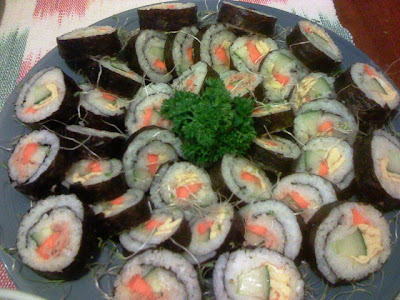 As you may have observed, you can actually put in a variety of fillings into the maki for various flavours. We did not include raw pink salmon, however, for safety reasons. But you can also put in mango, avocado, and other similar fruits for that added punch.